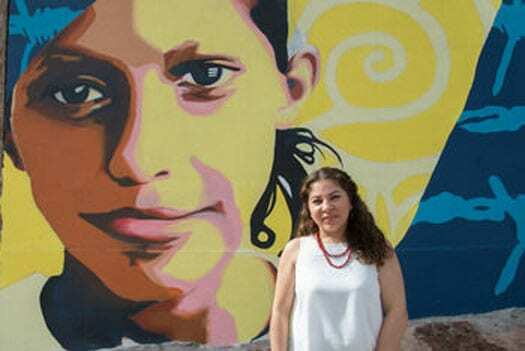 “US muralist Michelle Ortiz poses during the unveiling ceremony of her mural ‘My Community is Coming Out, There’s Beauty in my Community, We Have Potential.’” US State Department. That’s what is not understood by President Trump and other US officials threatening to use more border guards, walls, family separations, and even a trade war to halt the caravan from getting close to the American border. The forces that drive these individuals and families to attempt the trip are far stronger than any threat they—or others in decades past—could dream up. Some are fleeing gangs that terrorize their neighborhoods; others are seeking to escape domestic violence in their own homes. Still others, like Rodríguez, are desperate for jobs that can pay for school and other living expenses. The caravan—the second this year—comes less than three weeks before the November 6th midterm elections, causing the usually overheated immigration-related rhetoric to boil over. Earlier this year, the Trump administration announced its “zero tolerance” policy, leading to the separation of families at the border. More than 200 children remain in federal custody after over 2,500 children were separated from their parents from April to June, when Trump finally caved to pressure and halted the program (although he has not ruled out resuming the practice). Trump himself made the case for deterrence in a 60 Minutes interview: “When you don’t do separation, when you allow the parents [and children] to stay together, okay, when you allow that, then what happens is people are gonna pour into our country,” he said. Trump is not the only US president who believed a sanctions approach to immigration works. Former President Barack Obama’s administration tried to prevent people from crossing the border through a number of tactics, including family detention (albeit without separating them from each other) and running ads in Central America to discourage people from making the journey. But evidence shows these practices largely don’t succeed. The think tank Center for American Progress evaluated changes over time—from October 2011 to June 2018—in the monthly number of US Border Patrol apprehensions of families at the southwest border. It found there was no statistically significant decrease in apprehensions of families at the border after the widespread expansion of family detention in July 2014. This was found to be true even after taking seasonal trends into account. US-bound migrant caravans have been attempted for years. Traveling in numbers is perceived as offering protection from assaults, robberies, and shakedowns by police. They’re also a cheaper and presumably safer alternative to the $7,000 to $10,000 that smugglers charge for passage to the border, notes Stephanie Leutert, director of the Mexico Security Initiative at the University of Texas at Austin. Still, it wasn’t until this year that the caravans received widespread attention—mainly due to Trump’s predilection for tweeting his ire. Those mass pushbacks of asylum-seekers by CBP [Customs and Border Patrol] are plainly unlawful, and violate one of the most fundamental principles of international refugee law: the prohibition on refoulement (forcing people to a place where they might be at risk of serious human rights violations). This principle is incorporated into US law, which requires border and immigration authorities to receive and refer asylum-seekers for an interview with an asylum officer, in order to conduct individual assessments of any risks of persecution or torture that they may face upon return. However, the incoming administration of President-elect Andrés Manuel López Obrador, who will take office December 1st, is refusing to respond quite as emotionally or vindictively. Marcelo Ebrard, who will become foreign relations secretary, dismissed Trump’s tweets as a “political calculation” ahead of the US elections. Meanwhile, López Obrador is looking for ways to avoid repression against migrants—like getting at the root cause of migration by creating jobs for Central Americans. “Anyone who wants to work in our country…will have a work visa,” he said. What a contrast to the United States! The dangers of indigenous people’s activism on environmental and other issues have been well documented. Since philanthropic attention has been so spotty, interest has grown in a network of indigenous-led philanthropy.